In case you hadn’t heard, we here at Google Cloud Platform released the Cloud Natural Language API this week, and an open beta of the Speech API. Both the Natural Language and Speech APIs are just the latest examples in the Cloud Machine Learning technologies that we’ve made available to the public, following on the heels of the Vision API and Translate API. But what exactly do these latest APIs allow you to do? Google Developer Advocate Guillaume Laforge dives deeper into sentiments by color coding tweets as strong positive, strongly negative — or somewhere in between — according to the polarity and magnitude unearthed by Natural Language. 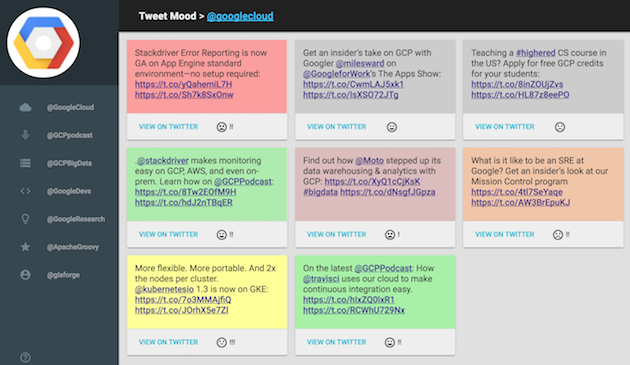 Turns out that @googlecloud tweets are all over the map, sentiment-wise, judging by this many-colored chart. Others may choose to sample much less colorful text streams, such as Theresa May’s inaugural speech as British Prime Minister. In a blog, Javier Ramirez, a Google expert at Teowaki, uses the Speech API to convert the audio to text, then feeds it to Natural Language to analyze its entities and sentiments. “I never suspected Brexit could be this fun,” he writes. We hope you’ll be the judge. Scroll down to the bottom of the Cloud Natural Language API page, and enter a snippet of text and try the API.